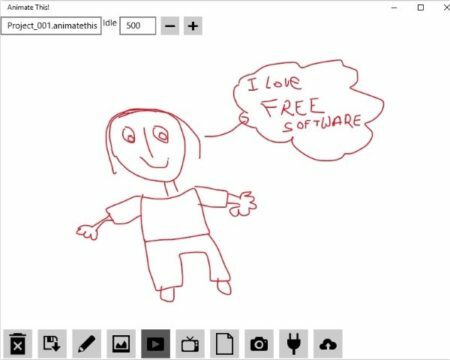 This article covers 4 free animation apps for Windows 10. Animation fascinates everyone be it kids or adults. If you like creating animation through drawings then you would definitely like these apps. 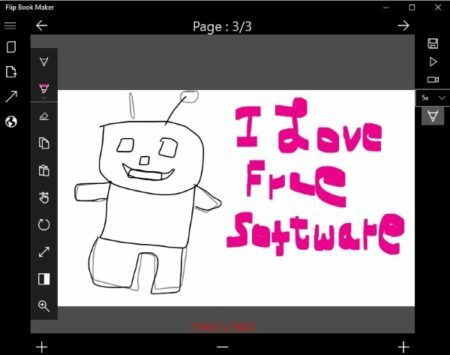 These apps let you draw and create animation using various tools. All these apps offer you to make drawing in continuation to the previous one. They duplicate the work done on the previous page and let you continue from where you left of. This will give a look of motion when you create a video out of these drawings. All these animation apps for Windows 10 are free and can be downloaded from the Windows 10 store. You can easily bring your creativity out using these simple animation apps. You can even make funny videos to share with your friends. 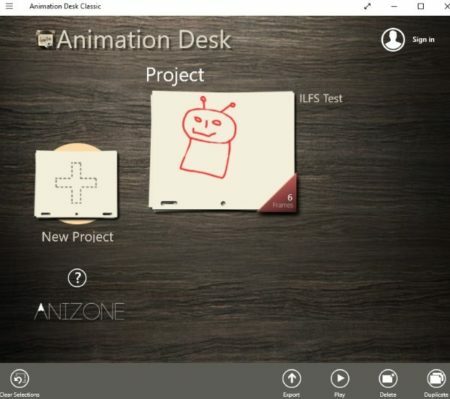 Let’s look at these free animation apps for Windows 10 below. Animate This! is a nice app to create animation out of your drawings. You can either make a creative animation video or you can even make a funny video to share with your friends. Once you download this app and launch you will see an interface like the one you see in the screenshot above. You will initially get a blank screen with all the options given at the bottom of the app window. Now from the options choose a blank page and start drawing. You can save a page and start drawing on another page. You can also save the drawing template to continue drawing from the point you left off. Once you are done drawing you can animate the drawing pages you created in two ways. You have two icons at the bottom of the page one for animate and one for create video. If you click the animate button you will animate your drawing and will be able to save them in GIF format. But when you click on the create video icon your drawing will be animated and can be saved in AVI video format. Check out a detailed review of Animate This! for Windows 10 here. Animation Desk Classic is a nice app to create animation out of drawings. When you start this app you will see a dashboard like the one you see in the above screenshot. To start a new project click the plus icon. A new blank drawing page will open up in the app window. With options on both the sides. You can start drawing and keep on adding pages to your drawing while keeping the original template as it is. On the right side of the interface you will have your drawing tools like eraser, colors, pencil, undo, redo, etc. Whereas, on the left side you will have options to add a new page to the drawing, open page management window, etc. The new page in the drawing can be a blank page, a duplicate page, or a repeat page. In duplicate page whatever you have drawn so far will be kept intact, so that you can start drawing from the point you left off. In the repeat mode the previous fame is repeated without any changes. Once you are done drawing, click on the projects tab on the left, which will take you back to your dashboard. From here you can play the animation that you just created. You can even export the video in MP4 format to your device. Zoetrope is a nice app to create animation. In this app you will see an interface like the one shown above. The left side of the app screen contains all the tools you would need. Start with a new project and draw animation cells option. You will be given a blank screen to draw on. You will have tools like pen, pencil, eraser, highlighter, background color, undo, redo, etc. You can keep adding drawing cells while keeping the previous drawing intact. This will show motion when you animate the drawings. 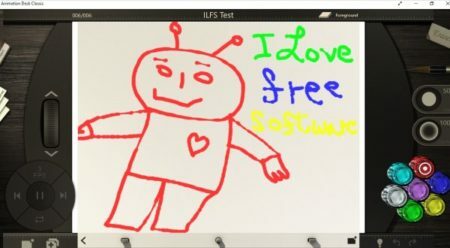 Once you are done drawing click the save button given at the bottom of the screen. Now you will be redirected to the screen shown above. Now you will have the option to add audio to your drawings as well. You can also rearrange the drawing pages if you want. The first play icon you see at the bottom of the app page will show you a preview of the animated video. If you are happy with the video then you can go ahead and save the video to your device. The video can be saved in three formats which are AVI, WMV, and h.264 video. You also get option to upload this video to YouTube from the app and print the drawing as a flipbook. Flip Book Maker is a nice app which can be used to create a animated video as well. The interface of the app can be seen in the screenshot above. The app interface is pretty simple. Start with creating a new file. You will get a blank drawing page with tools on the left side. The drawing tools include pen, pencil, highlighter, copy, paste, zoom, etc. Draw and click the plus icon at the bottom of the page to add another page to your animation. The previous drawing that you made will be carried over to the next page as well. Once you are done drawing, you will see two option on the right side. One is to play your animation in GIF format and the other is to output the animation as a video file. The video file can be saved in two formats which are MP4 and APNG. Click the video option and save your file to your device. Now you can play your video animation easily. 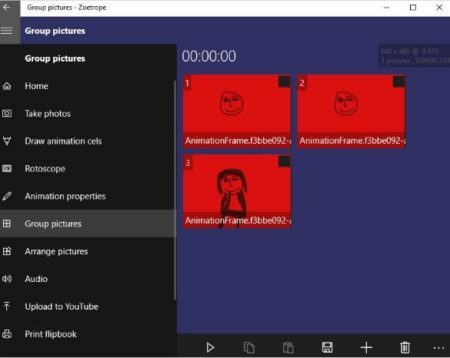 These are some good free animation apps for Windows 10. With the help of these apps you can easily convert your drawing to a animated video. You can make creative videos or funny videos, which ever you like with these apps. Try them out and bring your creative side out.